Yemen Houthi coup 'unlikely' Jump to media player A final coup by Houthi rebels in Yemen is "unlikely", a commentator claims. Yemen presidential palace 'seized' Jump to media player The editor-in-chief of the Yemen Post, Hakim al-Masmari says that it appears that Houthi rebels have taken control of the presidential compound. Houthi leader in Yemen TV address Jump to media player The leader of Shia Houthi rebels in Yemen has said that the country is at a critical and defining moment. Gun battles in Yemen capital Sanaa Jump to media player The BBC's Nick Childs reports on the severe crisis in Yemen where Houthi rebels are in control of large parts of the country, including the capital Sanaa. 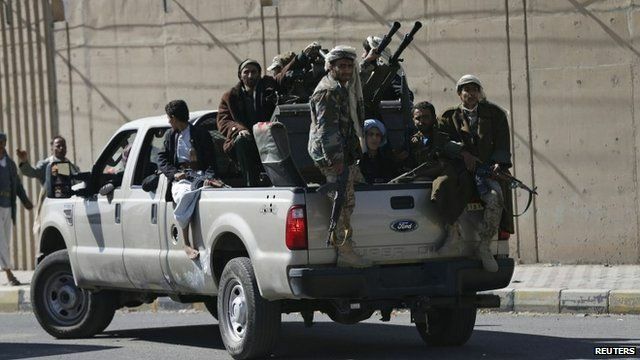 A final coup by Houthi rebels in Yemen is "unlikely", a commentator has claimed. Freelance journalist Iona Craig, who lived in Yemen for four years, said that the rebels had the opportunity to remove President Hadi in September but that they are more interested in boosting their negotiating position. The rebels have shelled the president's home in Sanaa and seized control of the presidential palace in their latest attacks after months of unrest.